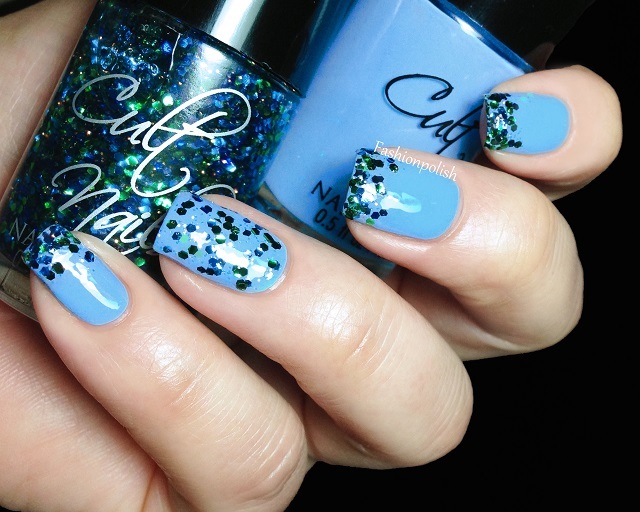 Are you girls ready for a another Cult Nails exclusive launch? Because today I have swatches of the upcoming Dance All Night collection! Featuring three cremes and three glitters, I decided to pair them by using gradient glitter tips with a full glittery accent on my ring finger. Faded is a beautiful pale grey creme with a subtle blue hue. Formula was as easy to work with as you would expect from Cult Nails and Faded looked perfect on the second coat. Walk of Shame is a gold glitterbomb with different sizes of gold hexes as well as micro holo glitters. Glitter pay off was amazing and sparkled like crazy! 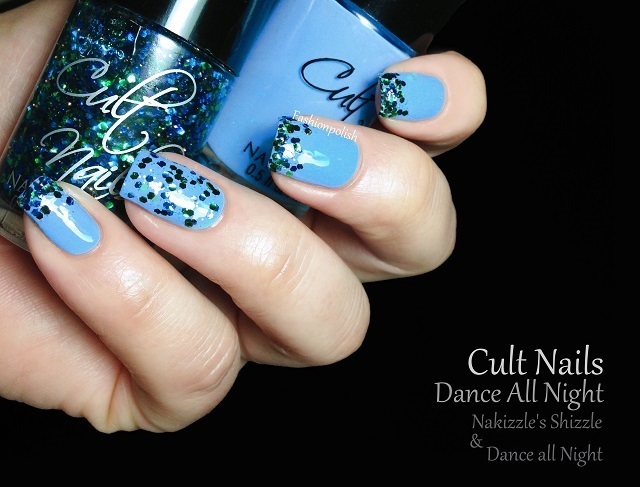 Nakizzle's Shizzle is a medium faded blue creme, soft but not pastel, bright but not bold. Formula was just as easy to work with and required two coats for complete coverage. Dance all Night is a mix of multi-sized hexes in green and blue combined with micro orange particles. The larger glitters were dominant here so I had to apply a second coat to get sufficient coverage on the tips but it was perfect for full application on the accent finger. Love at 1st Sight is a dusty and yet bright purple creme with strong pink undertones. I'm not a huge fan of purple cremes but this one looks surprisingly pretty on. Formula was outstanding, almost a one (careful) coater. I used two coats in the swatches below. Center of Attention is a mix of different sizes of pink hexes and color shifting micro glitters, from gold to hot orange. 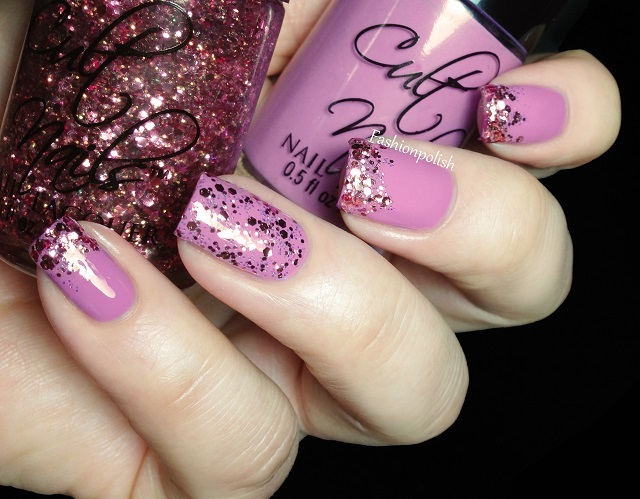 Great glitter coverage and application here, I love this one! I really love how different this collection is. 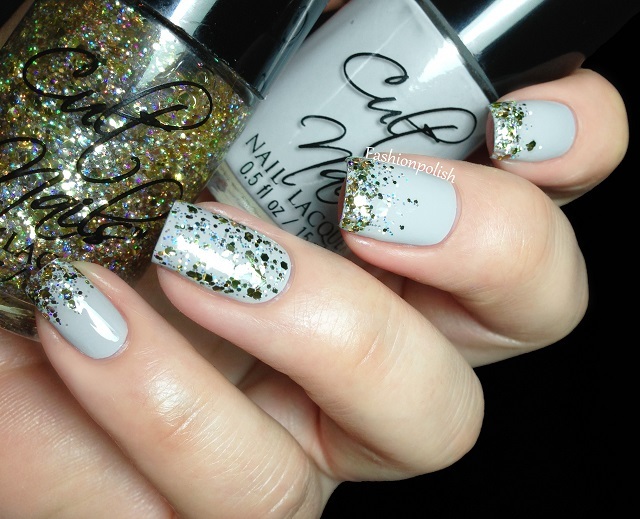 I wouldn't have expected a cremes vs glitters collex at this time of the year and these are absolutely gorgeous! My favorites : Faded, Walk of Shame and Center of Attention. 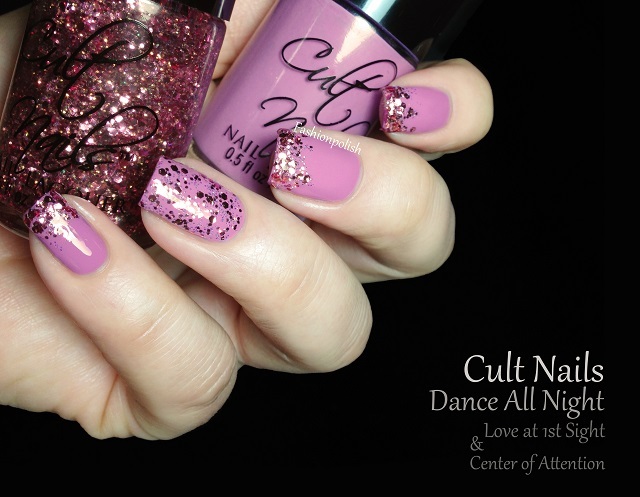 Cult Nails releases the Dance All Night Collection on May 9th, 2013 during a Preview sale. The collection includes 3 High Shine Creme's and 3 Glitter lacquers. The collection will be available during our Preview Event where the entire collection can be purchased at the discounted pricing of $60 for the set. (Retail $72). The first 250 orders will also automatically receive a bottle of Wax That (Not pictured), our new Wax Finish Top Coat that will allow you to turn any polish into a wax finish polish. Our Preview Event will run from May 9th - 18th 11:59PM EST. All polishes will be available for purchase individually starting on Sunday May 19th for $12 per bottle. What do you think about these? Do you plan on getting any of them? I definitely want the whole collection! But Fader is a must-have! Awesome collection! I want them all. I am loving the cremes! Beautiful Sam! love the glitter gradients! Oh wow. These are really lovely! Faded has to be fav. Gosh just when I said I wouldn't buy more polish, said I had enough. Well, maybe just these and then I'll stop.